There are a lot of different fermenters on the market. Most of us started with the standard 6.5 gallon plastic bucket, and many never looked back. Going against its dinosaur-like name, the Fermentasaurus attempts to be a vision of the future, and differs from the plastic bucket in material, shape, and features. Starting with the material, it’s made of PET plastic. That means it has an excellent oxygen barrier, is lightweight, and not fragile if accidentally dropped. Since it’s clear, you’re able to see what’s going on inside your fermenter from top to bottom. Not only can you see the krausen on top, you can easily see how thick it is. You can see how active the fermentation is going underneath the surface as you watch particles dance up & down inside the liquid. And you can see how things are progressing as yeast starts to settle out and collect on the bottom. The conical/teardrop shape helps guide precipitated yeast to the bottom and minimize the surface area of beer left in contact with spent yeast cells. Even better still, the Fermentasaurus comes with a collection bottle that can be unscrewed from the bottom once it fills with spent yeast. You can then either dump it or harvest it for re-use. When fermentation is done and it’s time to transfer your beer to bottles or keg, there’s a simple hose attachment that goes on the bottom to make transfer fast & easy. The teardrop shape does come with some disadvantages as it’s not very space efficient. You can’t stack it on something else for storage, and it requires a fair amount of space when you plunk it somewhere to ferment. It does have a metal stand that keeps it surprisingly stable, and the stand also has handles to allow you to transport it fairly easily when empty or full. The height is something to make note of though when planning your fermentation temperature regulation. It holds a hefty 35L (9.2 gallons) and stands just over 3 feet tall (37.5 inches) from bottom of the stand to the top of a 3-pc airlock installed in the lid. So your existing fermentation temperature control process may need some adjustment. You may have heard of open fermentation done in traditional British ales, or in wild sour Belgians. The Fermentasaurus allows you to go in the opposite direction and ferment in not only a sealed fermenter, but in a sealed + pressurized fermenter. Although the base setup comes with a lid with a hole for an airlock, there is also an optional pressure kit. The pressure kit lid has two ball lock fittings and pressure relief vent like a keg. It also comes with a unique floating pick-up tube if you want to carbonate in your Fermentasaurus and even serve out of it, but the main feature of this lid is the ability to ferment under pressure. Seal it up after pitching your yeast and the fermentation process builds its own pressure from the CO2 process. You can also hook up your CO2 supply tank to the ball lock fitting and fill the headspace with CO2 right from the start. Fermenting under pressure gives you some new process tools to work with. Some use it to ferment lagers at room temperature. Pressurizing the headspace affects the chemical reaction and actually suppresses the generation of esters that would normally be prevalent while fermenting lager yeast at warmer temperatures. I didn’t get a chance to personally test that, but it does sound intriguing. Another purported benefit of fermenting under pressure is that it makes an environment more like what the yeast experience when fermenting in giant stainless tanks at commercial breweries. The hydrostatic pressure of several feet of beer is substantial, and as most homebrew strains are derived from brewery strains, this gets them back to the environment for which they were cultivated. The clear PET resin that’s capable of handling up to 35 psi is what makes the Fermentasaurus unique. Don’t try it with glass for sure, and other regular PET fermenters can’t handle that kind of pressure. In my fermentation trial, I tested another suggested benefit of fermenting under pressure for dry hopping. It’s been suggested this keeps more of the volatile aromatics trapped in the beer. 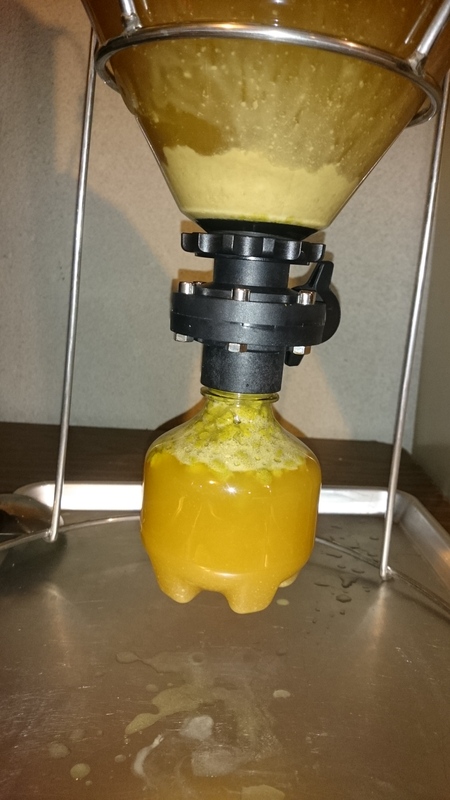 To test this theory, I made a NEIPA with a healthy dry hop charge. I took my 5.5 gallons of wort and split it between the Fermentasaurus and my regular PET fermenter. In my other PET fermenter, I was able to use my regular fermentation temperature control that kept the beer within 0.5 degrees of where I wanted it at all times. Based on the size of the Fermentasaurus, it had to manage with my cool basement temperature, augmented by towel wrappings and an electric heat belt. 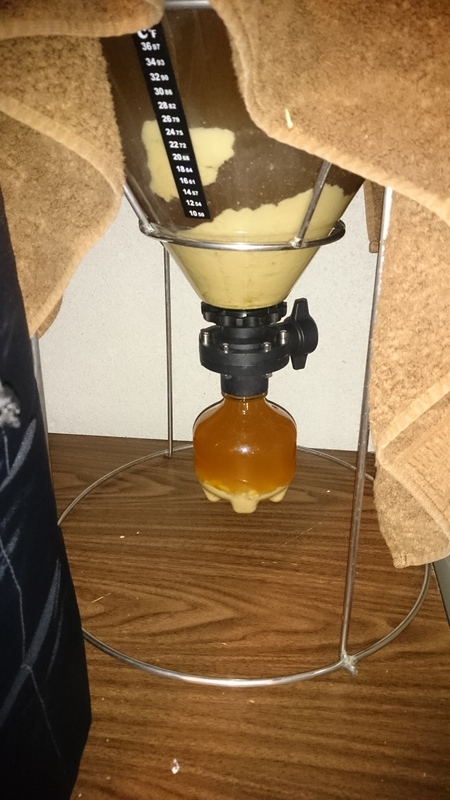 After fermenting for a few days in the Fermentasaurus without venting, the yeast particulate was filled up in the collection bottle at the bottom. I dumped that and filled up the collection bottle with my dry hop pellets. Opening the butterfly valve, I got some intermixing of beer and hop pellets, but had to do a bit of shaking and tapping to get the dry hops fully intermixed. I then had the typical green mossy layer of hop debris on the top of the beer, but after two days it sank away and I just had a smooth clear top as all the hop residue sank into the beer. I prepared to transfer the beer to a keg, and as I slowly cracked the lid to relieve pressure, the strangest phenomena occurred in the fermenter. Almost like it was boiling, the middle of my beer started to bubble and froth. I soon had a flow of hop reside from within my beer up to the top. At the end when the pressure was fully vented I had the same mossy thick hop residue blanket as I had going in my control sample in my typical fermenter next to it. So the pressure that built up while it finished fermenting eventually forced the hops down into the beer rather than floating in a layer up top. Blind and non-blind tastings were able to distinguish the beer fermented in the Fermentasaurus under pressure versus the beer fermented alongside it with my typical fermenter with venting valve. Opinions were split on which had the better taste, but the fact there was a difference detectable and the obvious visual difference under fermentation indicates there’s a tool here to use to explore characteristic effects in future brews. Overall the Fermentasaurus performed quite well. The parts were of good build quality, and importantly for something with so many different parts screwing together, there were no leaks. In past experiences I’ve had issues with some equipment that took some tinkering to avoid the slow drip from a screwed-together joint. None of that here as everything went together easily and required no special adjustment to keep my floor dry. The beauty of fermenting in a see-through vessel can’t be overstated, and the Fermentasaurus comes with a number of handy features for you to experiment with (yeast sample bottle, siphonless beer transfer, and pressurized carbonation). It costs more than a simple PET fermenter, but if you’re interested in exploring some of the more advanced features on it, it’s worth a try. The Fermentasaurus is imported from Australia and sold through MoreBeer in the U.S.
Special Thanks to Keg King/Oxebar for providing the unit used for evaluation in this review. This entry was posted in Conicals, Featured Reviews, Fermentation, Fermenters, Great Deals, More Beer, Recent MoreBeer, Reviews, Reviews & Top Posts on October 31, 2017 by admin. Thank you Brad, nice “hands-on” review, well written. I just came across both the Fermentasaurus and your review tonight, but see the date on the review was nearly a year ago, which is great for my question. How’s the durability? Still no leaks at connection points? How has the butterfly valve survived? I really like many (many) aspects of the Fementasaurus (not the least of which is the name), but want to ensure it can stand up to the test of time. Thanks for any insight you can provide. First time using the fermentasaurus, so far I really like it. Not having to transfer wine to different stages is great. I emptyed the bottom bottle twice to remove dead yeast. In a week my wine is ready to bottle, but it seems there is still some yeast left down in the neck of the fermentasaurus and not dropping down to the bottom bottle. Were you using the pressure kit with a spunding valve to control fermentation pressure accurately?Or just relying on the red relief valve on the pressure lid? I filled it with pressure from my keezer. Since it has a ball lock fitting in the lid, I just took a gas quick connect from my keezer and hooked it up. So it wasn’t a super-controlled trial, just wanted something simplistic to see how it worked. Right now I mainly use it as a secondary (if I need a secondary), and just make use of the pressurized lid to evacuate the headspace of oxygen and replace it with CO2. And for that I don’t need a controlled pressure. Just run a few fill-vent-fill cycles while hooked up to the gas line on my keezer. Great review Brad! I’m considering a conical and this is definitely on top 3 list. 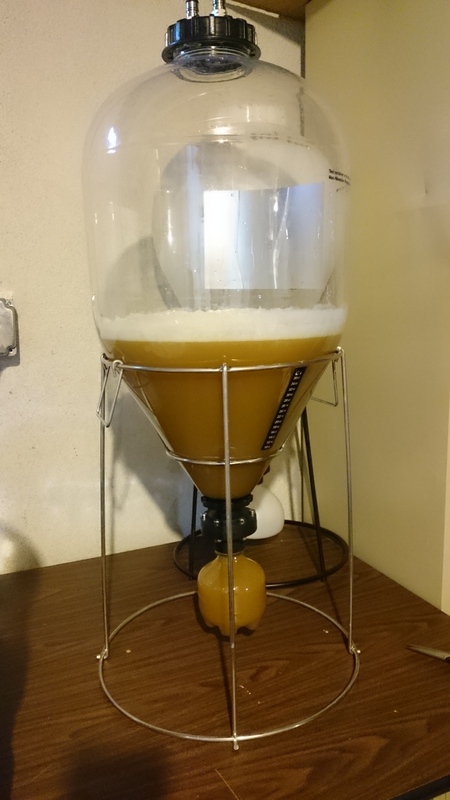 “prepared to transfer the beer to a keg, and as I slowly cracked the lid to relieve pressure, the strangest phenomena occurred in the fermenter. Almost like it was boiling, the middle of my beer started to bubble and froth.” – I can say with almost absolute certainty that this is CO2 coming out of solution in the beer and is not a strange phenomena, but something that should be familiar to anyone who has ever opened a 2 liter coke bottle. Gas solubility in liquid. in this case CO2 in beer, is a function of pressure, and in venting the fermenter you reduced the pressure and some of the CO2 came out of solution. Also, “So the pressure that built up while it finished fermenting eventually forced the hops down into the beer rather than floating in a layer up top” – A static pressure exerted on a system cannot force hop matter down into a liquid that the same static pressure is applied to. What likely happened here is that the CO2 that was “boiling” out of solution, likely forming at nucleation sites on the hop matter and thus agitated it up back to the top of the beer, where it never had time to settle out again. I learned a painful lesson recently about co2 coming out of solution. I used a stainless steel dry hopper on a keg of room temperature beer that had been sitting in the sealed keg for a while. It had a lot more carbonation than I anticipated and I was faced with a near mentos and diet coke scenario. The stainless dry hopper provided tons of nucleation points to cause the co2 to come out of solution and, whammo, I had a mess on my hands. Next time, I’ll chill the beer first if there’s a possibility it’s partially carbonated.